Bo Bo China Owner Shelley Tsan spends a lot of time laughing as we talk about her restaurant's recent health inspection. As of August 20, Bo Bo China was back to an A grade, but the restaurant on Sahara near Durango previously received a 39-demerit C on August 10. WATCH the full story with Darcy Spears tonight at 11 P.M. on 13 Action News. Inspectors found a pan on a trash can used as a prep table, foil-covered cardboard used as a lid for noodles and one of the critical violations was food at unsafe temperatures. "The stuff at unsafe temperatures they found was cooked chicken, pork chops, noodles, cut cabbage, orange chicken," Darcy Spears said to Tsan, reading from the health inspection. "Yeah, I know," Tsan responded. "It was mostly my food. "We were having a party with family. My husband cooked it for me to take it home." Another critical violation was improper handwashing. The chef, Tsan's husband, went from raw pork to cooked chicken feet and dirty equipment to food prep without washing his hands. "I think he was a little bit nervous, then touched the chicken. Forgot! You know, sometimes people are funny," said Tsan. Inspectors also found most food contact surfaces were dirty, as were racks, shelves, floors and walls. Tsan said it's not dirty and explained they were busy when the inspector came. "It's a small business, mostly take out and we keep it very clean, seriously." She says they've been in business at that location for 12 years and know what they're doing. "From my heart, I take care of customers. That's it." The other high demerit restaurant was Pei Wei on Eastern and Horizon Ridge. It got a 38-demerit C grade on its August 9 inspection, returning to a zero-demerit A on August 21. Inspectors found the chef had burn marks on his arm with peeling skin. There was expired tofu and crab rangoon mix in the walk-in. Chicken for lettuce wraps was undercooked and had to be thrown out as did lots of stuff from the prep line that was at unsafe temperatures. Inspectors also found portable speakers and cell phones on food contact surfaces. Pei Wei sent a statement saying, "The health and safety of our guests is our highest priority. We fell short of our strict quality standards at one of our locations and we took immediate corrective action to fix those issues." Our imminent health hazard closures begin at Jack In The Box on Lamb and Owens. It was shut down August 7 by inspectors following up on a report of food poisoning. 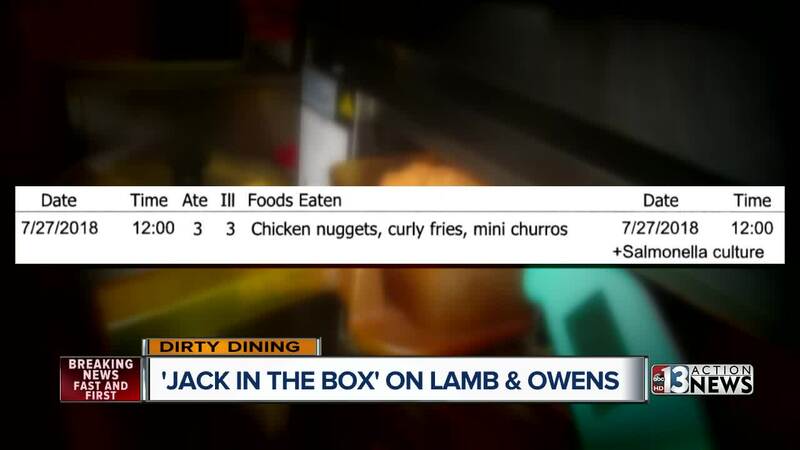 A customer tested positive for salmonella after eating chicken nuggets, curly fries and mini churros on July 27. Though they couldn't tie the salmonella poisoning directly to the restaurant, inspectors did shut Jack In The Box down for lack of adequate refrigeration. It reopened the next day with a zero-demerit A. The district manager said it was an unfortunate situation as their walk-in fridge failed on a very hot day. He says they take customer safety seriously and have pride in their track record in the Las Vegas community. At KFC, "There are few problems a bucket of fried chicken can't solve." Except, of course, when there's wastewater dripping into it. That problem was solved after the Health District shut down Kentucky Fried Chicken on Maryland Parkway and Sahara on August 10. There were two imminent health hazards: no hot water and liquid waste leaking from the ceiling onto hot holding food cabinets and prep counters. It was a quick fix, though, as KFC reopened just two hours later with a zero-demerit A grade. The general manager said the pilot on their hot water tank went out and an A/C unit froze up, causing the leak. He added that customers are their first priority. Snowflake Shavery also known as Milkywave on Spring Mountain and Decatur was shut down August 7 for no hot water. They were using dry wiping cloths to wipe down soiled food contact surfaces, two cutting boards were stained and no longer cleanable and the dirty drain board had a build up of "unknown source." They reopened the next day with a zero-demerit A grade. "Our call for comment was not returned." And finally, Krazy Buffet on Sahara and Cimarron was shut down August 6 for failing re-inspection from a previous C grade. Undercooked chicken and fish were put out for the customer buffet, there was mold in the ice maker and dirty water pooling on floor tiles. The manager said they've hired a food safety consultant to help them keep everything clean and maintain the A grade that they got back on August 10.